​The 6th Army was a field army unit of the German Wehrmacht during World War II. 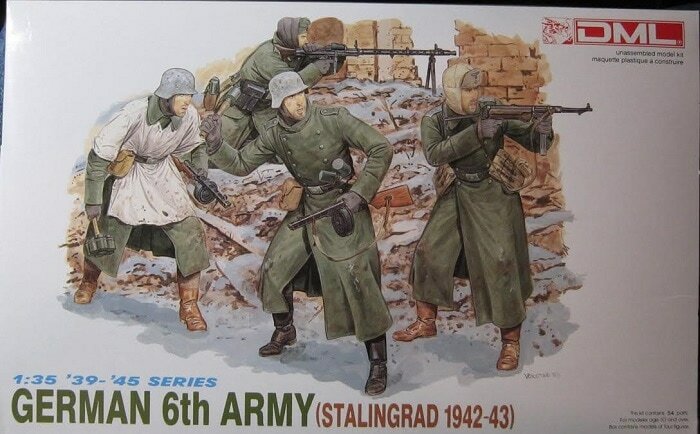 The 6th Army is still widely remembered for its destruction by the Red Army at the Battle of Stalingrad in the winter of 1942/43. It is also infamous for the war crimes (such as the massacre of more than 30,000 Jews at Babi Yar) it committed under the command of Field Marshal Walther von Reichenau during Operation Barbarossa in 1941. The kit comes in a shrink-wrapped end opening type box. I am no fan of this type of box as invariably the decal sheet or parts find their way past one of the end flaps to become lost forever. Give me a tray and lid type box any day of the week. The box art shows 4 figures fighting next to a knocked out building and a pile of rubble. Three figures are standing and one is prone. The first standing figure is in a crouch and wearing a white parka and a steel helmet. Under the parka he wears a long winter coat. He wears black jack boots. He is armed with a captured Soviet PPSH 41 machine gun and has a cluster of potato masher type grenades in his right hand. The second standing figure is wearing a long winter coat and black jackboots, plus a steel helmet. He has 2 potato masher grenades tucked in his belt and is preparing to toss one with his right hand. He is also armed with a captured Soviet PPSH 41 machine gun. The third standing figure is wearing a long winter coat and jackboots. He has a soft wool hat on his head with a hood over it. He is armed with a MP40 machine gun and has ammo cases for it on his belt. 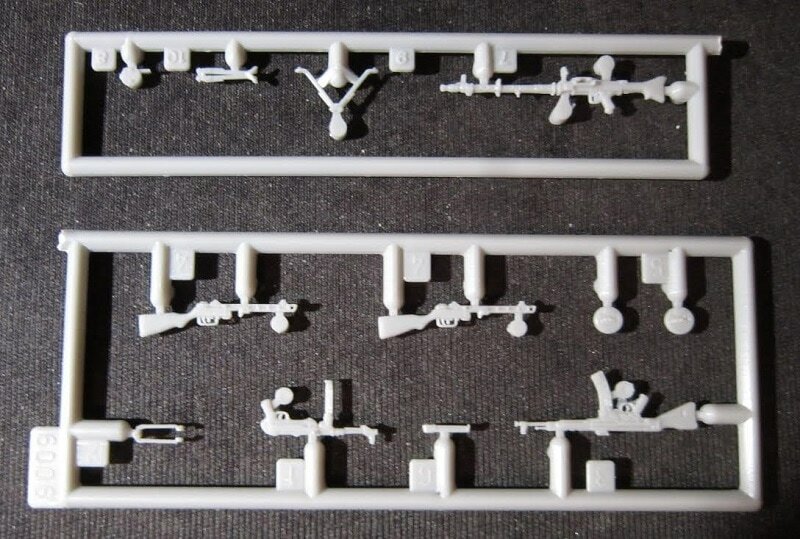 The fourth figure is prone and firing a MG34 machine gun. He wears a soft side cap covered with a hood. He has an ammo case and a canteen on his belt. He too has a long winter coat and jackboots on. 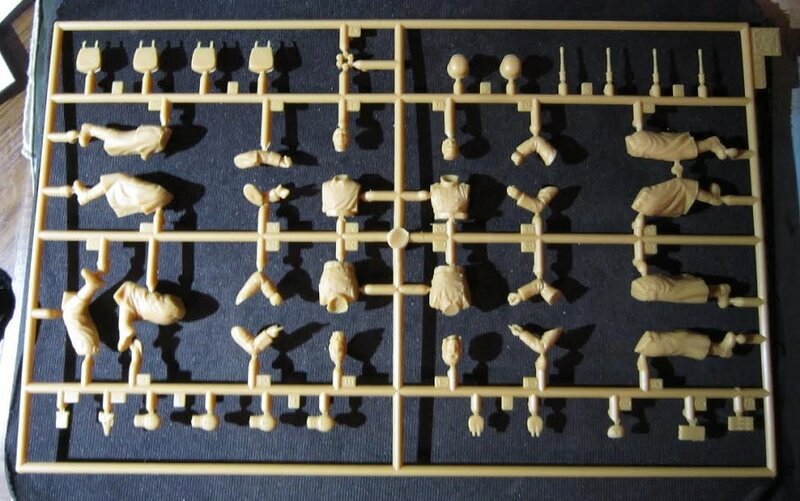 One corner of the box art says that the kit is intended for modelers over 10 years of age and that it contains 54 parts. One side panel has 3 color box arts of other kits that DML manufactures: kit no. 3309, U.S. Green Berets, kit no. 6010, U.S. Army Airborne Troops (Normandy 1944) and kit no. 6014, Waffen SS Tank Crew 1944-45. ​The other side panel says that the kit contains parts for 4 figures and paint and glue are not included, in 6 languages including English. This is followed by Marco Polo Import, INC's. street address in City of Industry, CA and their FAX number. Marco Polo was the U.S. inporter of DML kits in the 90's. The copyright date of the kit is 1993 and the kit was made in Hong Kong, China. The bottom of the box serves as the assembly and painting instructions. There is 2-view of each of the 4 figures. Below these is black and white line drawings of: felt & leather boots, a waterbottle (canteen), a winter hat and a Bread bag. All illustrations are by DML's resident artist Ron Volstad. Th kit contains one large light-tan tree and 2 small light-grey ones in 2 sealed cello bags. The large-tan tree holds: the figure parts (divided into seperate heads, torsos, arms and legs), 4 potato masher type grenades. 2 steel helmets, a cluster of grenades, 4 bread sacks, 4 canteens, a pistol holster, 2 snail drum ammo pouches and 2 MP40 ammo pouches (46 parts). ​The first small light-grey tree holds: a MP44 assault rifle and its ammo clip, a MP40 submachine gun and its wire shoulder stock, 2 captured PPSH 41 Soviet machine guns and 2 snail drums of ammo for those (8 parts). The second small light-grey tree holds: an MG34 machine gun, a snail drum ammo drum for it, and a folded and a deployed bipod for it (4 parts). 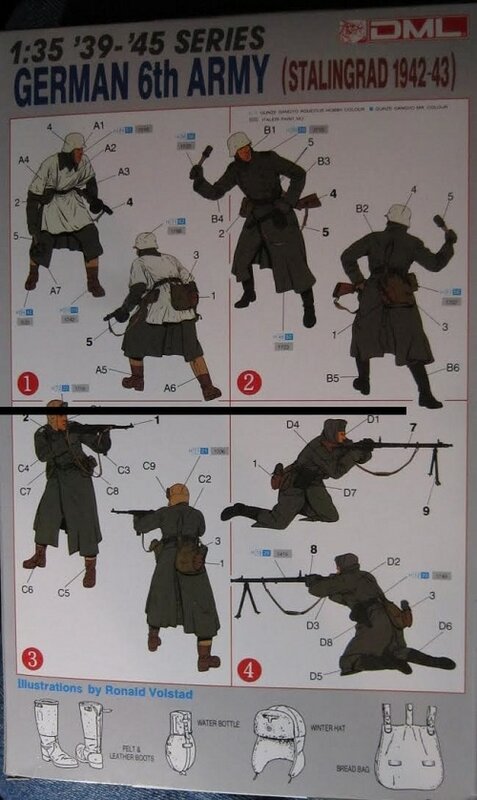 ​This is a neat kit with good detail and great poses. ​I bought my kit at my local hobby shop back in the early 90's.